This is the first robot I made while attending SAIC in Chicago. It was the project which got my feet wet and ultimate caused me to fall in love with electronics and fabrication. I had never used any shop tools before or even touched a soldering iron for that matter. I came a long way in four months from literally knowing nothing to programming, engineering, and building a working robot from raw materials. This little drawing to the left was the first concept sketch I proposed to my professor. 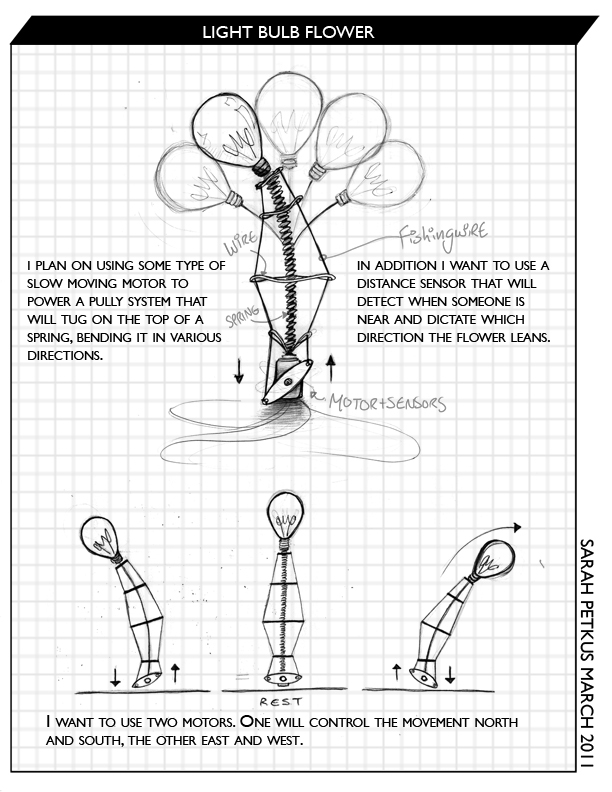 I called this robot ‘Flower’ and aimed to have wire pulleys powered by two servo motors tug its spring body in the direction of any onlooker its sonar sensor could pick up in the vicinity. In addition to leaning, I wanted the light bulb on top to glow and dim according to how close people came to it. The flower was supposed to seem curious and interested in its environment… ‘alive’ in fact. I’m not going to outline Flower’s creation because I finished it last year. I more or less wanted to provide an example to show where my head is at because most of the projects I’m planning steam off of this Flower model (no pun intended). In the end I produced a robot that looks much like the drawing above.